As I noted recently, Marx explicated the ‘value-form’ in four published texts. Although the texts can be demanding of the reader at times, the resulting theory is relatively straightforward. When discussing Marx’s work, some writers try to illustrate the progression of his argument, which I think is a good idea. Here are three illustrations I’ve come across. Let me know of any more. 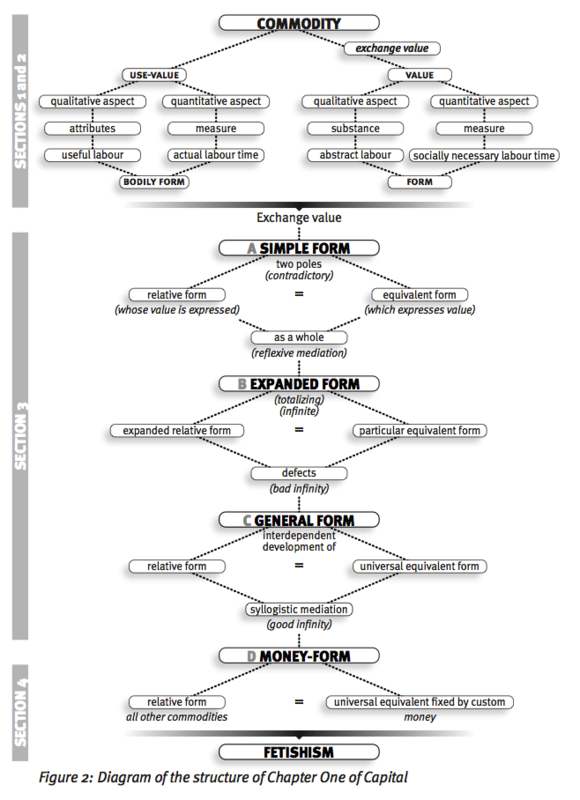 This illustration of the ‘simple value-form’ is from Milios et al (2002: 25). I really like it. This next illustration is quite different because it’s trying to show the unfolding of Marx’s argument (which includes the above ‘simple value-form’) in the first chapter of Capital. It’s from Harvey (2010: 26). Harvey’s illustration is very high-level. My preference is for that of Cleaver (2000: 93). Again, it’s an illustration of the unfolding of chapter one of Capital, but provides just the right balance of abstract overview and essential detail so as to remain useful. It offers both the detail of Milios and the overview of Harvey. It’s also copyright free, so unless I come across a better version, I will be using it in my article. This week, I’m reading as much value-form theory as I can in preparation for an article I want to write on the ‘Student as Consumer’. Marx’s theory of the “value-form of the commodity” was developed over four different published texts. I have linked to them below in chronological order. It’s very interesting to read them in succession in terms of how Marx tried to make it easier for the reader. There’s something to be gained from using each text and as such a later version does not necessarily supersede the former. My preference is to usually use the third version (the appendix to the first German edition of Capital) because it is structured in a very pedagogical manner, unlike the first version which is especially dense reading. Capital (1867) 1st German edition (Chapter 1) See Preface, paragraph 3 & 4. Capital (1873) 2nd German edition (Chapter 1) See Afterword, paragraph 2. Some of these notes were eventually turned into a journal article for Workplace: A Journal for Academic Labour. There is a great deal written about the apparent crisis of academic work, its so-called ‘performativity‘, its precarity, its taylorisation, and in general its violation by a variety of ‘neoliberal’ technologies. I’m increasingly inclined to think that any author whose argument rests on a critique of ‘neoliberalism’ simultaneously reveals the limits of their argument. Simon Clarke once described ‘neoliberalism’ as “a reassertion of the fundamental beliefs of the liberal political economy that was the dominant political ideology of the nineteenth century.” His point in that article is that despite a variety of periodic expressions, the problem that our critique must always be mindful to address is the problem of capital. When the problem is deemed to be ‘neoliberalism’, attempts to critique it are likely to remain as superficial, unscientific and moralistic as neoliberal theology itself. There was the practical knowledge of businessmen about how the market worked, a knowledge that proved true because it made them rich. There was the vulgar propaganda of 19th century economists and politicians, who spun theories out of this practical knowledge to defend it, and whose knowledge was also true to the extent they were able to dominate this society with their (to Marx) crude schematic of how the market worked. There was theoretical work of classical economists like Smith and Ricardo, whose more sophisticated and in-depth analysis of the human conditions produced by the market Marx admired as a truer picture of the historical moment of capitalism from the market’s vantage point. There was Marx’s own truth, that human conditions under the sway of this market could only be understood by going beyond the market, historicizing it and completing it with a picture of the production process off-stage that made the market possible. The point that Moten and Harney make, which I think is correct, is that most critical analyses of academic labour identify the problem somewhere amidst the first and second levels of analysis; that is, the problem is (1) the conditions of the labour process (e.g. its precarity and expressions of performativity); or (2) the ideologies which support and maintain that labour process: ‘neoliberalism’. Clarke’s short article can be read as an attempt to shift the critique away from these relatively superficial levels of analysis, to a more foundational understanding of the problem (3) and its revolutionary, scientific critique (4). Moten and Harney make this clear, too. This section in their article is titled ‘Abstracting Academic Labour’ and it seems to me to be an implicit reference to the method undertaken by Marx, which was to “rise from the abstract to the concrete“. A ‘golden age’ of individualism? Moten and Harney are critical of the “vulgar” theorisation of academic labour which views the university as a market, either a romanticised one in which “a special and limited brotherhood” of individuals offer their wares, or that of a centrally planned factory which produces and circulates knowledge as a commodity so as to realise exchange value. Both market-led perspectives, they argue, reveal an internalisation of a production line, “from that golden age when we cared not to see we were part of a centrally planned knowledge factory, to what we might call the internalization of a cybernetics of production.” In our resistance to the university as a factory, this internalisation causes both perspectives to view academic labour as a position rather than an activity. This is something they argue in their book chapter, ‘Doing Academic Work‘. 2 There, they reiterate their criticism that academics talk (and write) critically about the conditions of their work but also set themselves apart from most other workers in that they disavow both the “mutual interdependence and the sociality of her or his product.” Moten and Harney’s position is that “most professors in the United States are part of the service sector proletariat”. In short, they suggest that the subjectivity of academics is one which tends to view academic work as a position, rather than an activity and this leads them to focus not on what it means to be an academic worker but what it means to do academic labour. This focus on the doing or activity of academic labour is the starting point for understanding academic labour as a form of social production that extends both across and outside the academy. Moten and Harney’s argument points to a possible reason why most critiques of academic labour reside at the level of the labour process fetish, within the discourse of vulgar theory, and concerned with the minutiae of our conditions rather than our abstraction. It is because of the absence of a collective agency among academics, one that is grounded in the common production process of the university as a social, co-operative endeavour, that we remain preoccupied with our individual position in the ‘marketplace of ideas’, over and above the way we reproduce ourselves through an active dependence on other workers and students. Moten and Harney draw from Burawoy’s term of the “social relations in production” rather than the “social relations of production” to underline this point. What is especially interesting about their argument is that this social labour is not simply constituted by academics, but by both academics and students labouring together. The increase in total output is likely, at least initially, to realise an overall greater amount of surplus value for the university, but when it is the student’s labour power that is being (re)produced, the decrease in the value of their primary commodity is cause for concern. 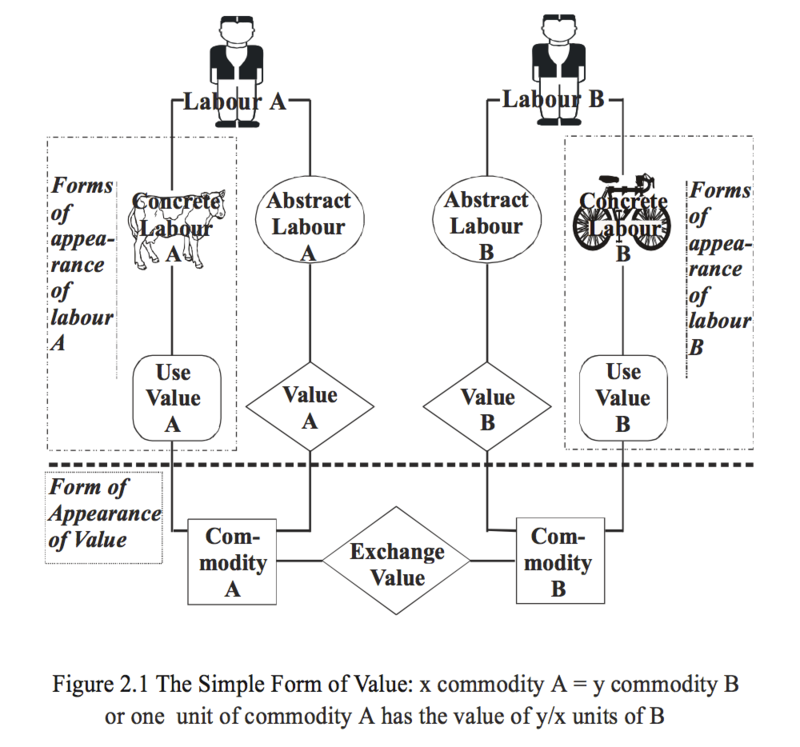 Marx goes on to show how in the simplest form of exchange, commodity A is relative to its equivalent, commodity B. The value of the use-value A (what it is worth) is realised in the exchange of its equivalent B. Likewise, the equation can be reversed so that the value of the use-value B is realised in the exchange of its equivalent A. In both equations, the exchange value is the form of value of each commodity. I will elaborate on this important point another time [here it is], but needless to say, Moten and Harney provide a very useful way in to thinking about the process of knowledge production in terms of Marx’s labour theory of value. They do not attempt a full explication of it, but enough to suggest that the labour power of the academic and the labour power of the student must be dialectically analysed. Now, this is very interesting, not least because it largely concurs with Student as Producer as it has been developed by my colleague Mike Neary, but also because I think Moten and Harney’s analysis of academic labour helps enrich Student as Producer as a critique of academic labour and the idea of the university. They argue persuasively that academics are continually “repelling” the embodied “threat” that the student’s labour power is ultimately equivalent to their own in the production of knowledge, and this resistance is undertaken by “holding steady” the moments of circulation and realisation “as categories of individuality.” In this way, academics define students as consumers in the exchange relation. It is, in effect, an act of hypostatisation where the academic isolates their work and concretises it as an intellectual craft, and in turn, isolates the student as an individual consumer of the academic’s knowledge product. Turning the student worker back into the student is an attempt at creating “distance and difference” between the two individuals, when in fact, in the capitalist university, both academic and student are relative and equivalent forms of the labour power commodity, each with a concrete and abstract character. Moten and Harney discuss all of this using the example of affirmative action, but I think that what they are implicitly attempting to reveal is Marx’s labour theory of value in action and our constant attempts to deny its inhumane reality where, as Holloway states, humanity “exists in the form of being denied” (Holloway 2002:213). To assert one’s individual identity as an academic is to try to assert one’s dignity. To extend an analysis of academic labour only so far as the conditions of that labour is an understandable outcome of trying to preserve some dignity within an inhumane process of real abstraction.